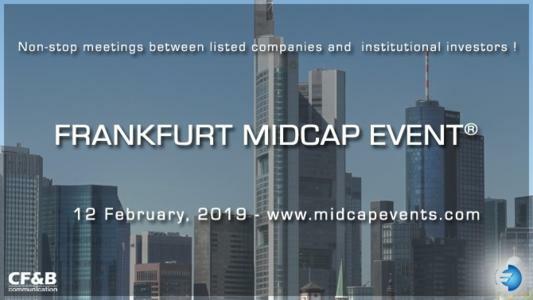 On February 12th 2019, CF&B Communication is organizing the 12th edition of the Frankfurt European MidCap Event, where selected Midcaps travelling to European financial capitals will stop off in Franckfurt to meet the attending institutional investors. For one day, top managers of listed companies (France, Italy, Spain mainly, but also Austria, Germany and Switzerland) will present fund managers with details of their activity and perspectives in pre-organized one-to-one meetings. About fifty listed companies, as well as around one hundred institutional investors are expected to attend the event.